5 June 2015 The Swansboro Young Marines held their monthly awards ceremony. Young Marine Private Emma Sherman was presented a Certificate Of Appreciation by Marine Corps League Swansboro Detachment #1407 members; Don Broussard, Tim Manchester, and Alex "Gunner" Nevgloski Sr.
2 May 2015 Young Marine PVT John Scofield received a Certificate Of Appreciation for his volunteer service at the Marine Corps League Swansboro Detachment Pancake Breakfast. 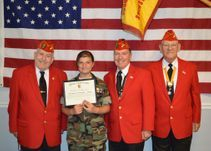 Young Marine Scofield is a member of the Swansboro Young Marines. Commandant Alex "Gunner' Nevgloski Sr. and Sergeant At Arms Tim Manchester presented the award.